His name is Rhodar. Some call him an uncivilized barbarian, but he is a man of honor and he does not turn away when a young woman in distress needs to be rescued from the clutches of a family of trolls. He never runs from a fight, but neither does he reject the favors of a beautiful woman who invites him into her bed. Not only is he a ferocious fighter against his enemies, he’s just as fierce and tireless in the arms of a woman. From the Western Plains beyond the mountains, Rhodar is on a quest to find the sorcerer Arguss, the only one who can restore the fading spell on his battle-axe. 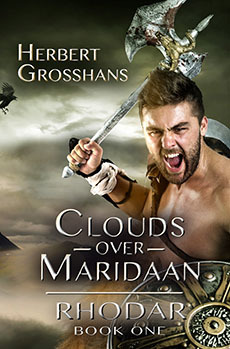 Rhodar intends to cross Maridaan as quickly as possible, but the gods do not care about the plans and desires of one man. They weave their own designs and they are different from the wishes of mere mortals. Rhodar begins to fear his journey will come to an end in Maridaan. Seal and Rumos, the two night suns, illuminated the grisly scene below. The riders burst upon the small camp from out of nowhere. One of them killed the old man who stood guard with one vicious thrust of his lance. The others spread out, plunging their lances into the dark shapes on the hard ground. Men and women, lost in their dreams, died without knowing their murderers. A few woke—too late. Death came mercilessly on swift, dark wings even to those. When it was done, the riders slid off their mounts, stalked through camp on long, stiff legs, overturning cooking pots and scattering bales of cloth and garments from the low wagons. Some walked among the slain bodies, turning them over to look into the dead faces. They searched for something or someone. One of them, who appeared to be their leader, spoke words in a harsh, hissing language. He was taller and broader than the others, his face hidden inside the hood of his cloak. Only his eyes glowed in the darkness of his cowl. Lifting those eyes to the sky, he uttered a shrill, piercing cry. Moments later from close by came an answer. A large shadow separated from the branches of a tall tree and glided silently toward the caller. The light of the night suns reflected momentarily on outstretched talons and a long, wicked beak, as the creature settled on the shoulder of its master, folding black wings like a cloak around its feathered body. The riders mounted their steeds and disappeared as silently as they had come, leaving their bloody deeds behind. A sob and then a loud cry came from one of the low shrubs surrounding the clearing. Two figures emerged, one small, the other one taller. The pale light revealed a white, oval face, framed by long, blond hair—a girl by all appearances. She hurried after the small figure that ran toward one of the still shapes on the ground. “Come back, Kalo,” she called, her voice quavering and breaking as she saw the bloodstained earth. “They killed my Momma,” cried the little boy. He cradled the lifeless head of a woman in his arms. The girl reached him and gently pulled him away. As the dead woman’s head lolled to the side, blood oozed from her open mouth. The girl screamed, grabbed the boy, and ran blindly into the protection of the trees. At dawn, the first scavengers moved in, tearing and ripping the welcome meat from bones, growling and snapping at each other with bared teeth, not willing to share the bounty even with their own kind. When an intruder dared to disturb them at their meal, they lifted their heads, snarling angrily. Tall, with wide, massive shoulders, his muscular arms and bare upper chest were bronzed by long exposure to the sun. Two steely blue eyes narrowed as they took in the gruesome scene. A short kilt fashioned from the striped skin of a lion-wolf covered his lean hips. He rode a large, muscular horse with a glistening black coat. “Looks like we’ve stumbled onto something unpleasant, Nightwalker,” the big man rumbled. He reached for the battle-axe slung across his back, hefting it easily. When the tall warrior advanced, the carrion-eaters bared their long sharp fangs, but slunk away, their thick tails between their legs. One, bolder than the others, tried to take a stand and died screaming as the double-bladed weapon split its skull. Turning his broad back to the watching animals, the man bent to examine one of the dead. “Pretty,” he murmured as he peered into the face of a young woman. A thick crust of dried blood hid a deep wound caused by the murderous thrust of a lance between her full breasts. “Much too young to have died so horribly.” His eyes glimmered with a cold fire and the muscles of his jaws stood out rigidly. As he bent over another of the still bodies, his sharp ears detected the sound of someone approaching. Straightening, he turned to look at the trail spilling into the clearing from the other side. A lone rider burst out of the forest. He was young, with a scowling face, short but broad and muscular. Padded leather armor protected his deep chest; his thighs were bare and the boots he wore reached over his knees. In his right hand, he carried a short, curved sword. A long bow and a quiver filled with arrows were slung across his back. His steed reared on its hind-legs when he brought it to an abrupt halt, clawing the air with cloven hoofs. The two men looked at each other, but before either of them could react, a score of men broke from among the trees. Small and agile, they were clad in green garments. They carried short bows, arrows nocked and aimed at the tall warrior. “Admiring your work?” said the horseman. “Let us use him for target-practice, Lord Carn,” said one of the green-clad men. While most of the small men searched the bodies, three of them cautiously approached the tall warrior. He watched them come closer, his battle-axe half raised, but then he shrugged, dropped the axe and held out his arms. “So you say, but the evidence is against you,” Carn said coldly. “Enough of this babble.” He turned away, sheathing his curved sword. “Did you find her?” he asked the nearest of the green-clad men. They shook their heads. “No, she’s not among the slain,” said one of them. “How? By each male member of your tribe giving them one last ride?” The man laughed. The woodsman bowed. “Yes, my Lord.” He bent to pick up the big battle-axe but managed to get only the handle off the ground. Straining unsuccessfully, he called another one to give him a hand. Both tried without success. The shiny double-bladed head stayed on the ground. “Who is Saleen?” Rhodar said. Rhodar did as ordered. They tied a strong rope around his wrists and fastened the other end to a wagon. When that was done, Carn gathered most of his men together and rode off, his men following single file. Five stayed behind to take care of the wagons and the prisoner.